In accordance with the 2012 Great Lakes Water Quality Agreement, a draft 2018-2022 Lakewide Action and Management Plan (LAMP) has been prepared for Lake Ontario and the connecting St. Lawrence and Niagara Rivers, and is currently available for review and comment. The draft LAMP was developed by the Lake Ontario Partnership, a collaborative team of natural resource managers led by the governments of the U.S. and Canada, in cooperation and consultation with state and provincial governments, Tribal governments, First Nations, municipal governments, and watershed management agencies. 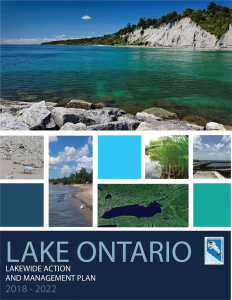 The LAMP for Lake Ontario identifies key priorities for the lake and connecting rivers, and guides the coordination of binational environmental protection and restoration activities aimed at preserving and protecting Lake Ontario’s water quality and ecosystem health. The Lake Ontario Partnership would like to provide an opportunity to review and provide comments and input on the draft 2018-2022 Lake Ontario LAMP. Please use the Contact Us page to direct your questions and comments by June 13, 2019. You may also join the conversation on the Lake Ontario LAMP at www.placespeak.com/letstalklakeontario. This entry was posted in Documents, Engagement, Engagement Documents, Engagement Opportunities, Engagement Opportunities Happening Now, Lakewide Action and Management Plans, Lakewide Management (Annex 2), Lakewide Management Documents and tagged Lake Ontario, outreach by . Bookmark the permalink.